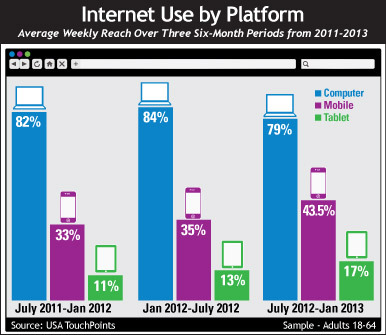 This USA TouchPoints analysis looks at the relative average weekly reach of Internet use among Adults 18-64 across Computer, Mobile Phone and Tablet in the three six-month periods between July 2011 to January 2013. Prompted by a recent article in The Wall Street Journal, which highlighted the drop in computer sales and shipments (sales were said to be in “freefall”), we looked at Internet use as an indicator of the overall health of a device, as well as an indicator of which direction things may be heading. We know smartphone and tablet sales are rising, and content is increasingly being specifically designed for these platforms. Looking at data gathered over the three most recent waves of USA TouchPoints (July 11- Jan 12, Jan 12-Jul 12 and July 12-Jan 13), we see that change between the first and second wave is marginal and consistent across all three platforms — an increase of 2% in each case, representing a small net increase in Internet use across the board. However, in keeping with the position put forward in the WSJ article, the third wave ((July 12-Jan 13) shows a drop of 5% for Internet use on Computer, while both Mobile Phone and Tablet show increases: 8.5% and 4%, respectively. While it is too soon to say that this represents a trend that will continue, it is interesting to note that the third wave figure for Computer is 3% year-on-year. It seems to be the Mobile Phone (or more accurately the Smartphone) and the Tablet that benefited more during this last period, which covered the back-to-school/college boost to sales, Black Friday and the holiday season in general. The same analysis in another 12 months will be particularly revealing, as well as critical to the well-being of computer manufacturers.